This is the second of five sermons I’m delivering based on the insights I’ve gained from reading Sky Jethani’s book WITH, Reimaging The Way You Relate to God. I want to tell you a very short story. Jesus told very short stories; they’re called parables. Here’s a modern-day parable that I’ve written for this sermon. I’ve titled it The Father’s Notebooks. Jason’s heart pounded as his aunt explained over the phone what had happened. She had e-mailed him a week earlier that she had found two notebooks that had belonged to his late father, and she said that she’d send them to Jason. His mother had died when he was a teenager, and now his father had recently passed away. In the e-mail his aunt had told him that one notebook contained detailed information about how his father was going to restore the 1948 Hudson car that he had been keeping in his garage all during Jason’s growing-up years. Now, after his dad’s passing, the car was in Jason’s garage and he was planning to carry out the restoration. His father’s notes would be invaluable. The other notebook, his aunt had written, was a journal that his dad had kept, unbeknownst to Jason. She wrote that she had only flipped through its pages and then closed it when she realized that it was very personal. It was a journal that his father had kept since Jason was born, and it was filled with entries addressed to Jason about his father’s feelings concerning life in general, his reflections on his growing son, and his hopes and dreams for him. Now his aunt had just informed him that one of the journals had been destroyed by her large St. Bernard dog; he had chewed it to shreds. Then there was silence on her end of the phone. She had an annoying habit — Jason had been aware of it all of his growing-up years — of telling you only part of a story or giving you just a bit of information, then waiting for you to ask her to tell you more. Not surprisingly, she was doing that now: waiting for him to ask her for more details. “So which of the two journals do you still have?” Jason asked, holding his breath and hoping she’d tell him what he so badly wanted to hear. Jason breathed a huge sigh of relief. It was relief that he could never in a thousand years have put into words. Is the Bible God’s notebook, packed with spiritual principles by which you and I are supposed to live? Or is the Bible God’s personal journal to you and me? It’s actually both, but In our faith do we focus primarily on the divine principles or on the Divine Person? Author Skye Jethani calls a faith primarily focused on following God’s principles life OVER God. 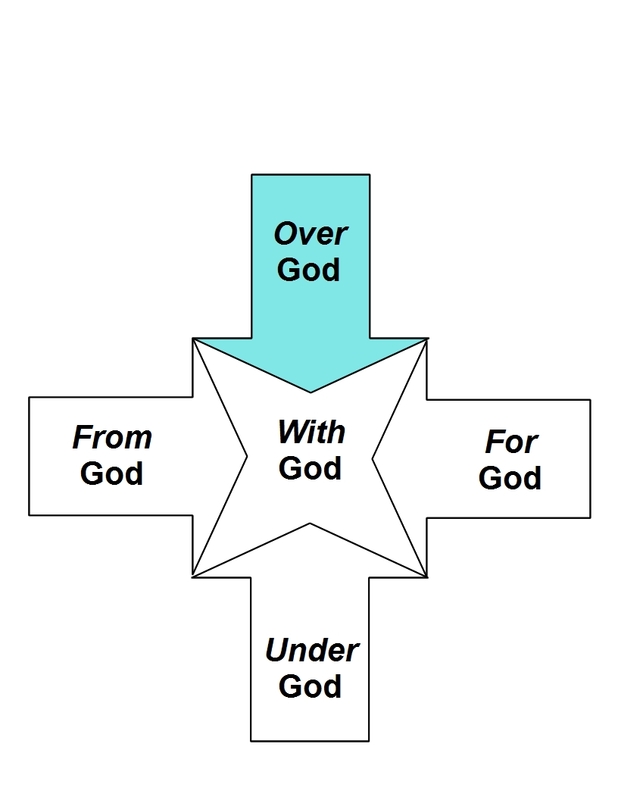 Jethani uses five words to help us understand the ways we can relate to God: UNDER, OVER, FROM, FOR, and WITH. Again, I want to credit Skye Jethani for the basic premise of this message and for this entire series of five messages, ideas found in his book With: Reimaging the Way You Relate to God. Jethani points out that a popular world view sees God as a divine watchmaker. Many people believe that one way or another, God created everything that there is. However, they also believe that He got it going and that now it pretty well runs on its own. It’s sort of like a watchmaker who makes a watch, winds it, and that’s the end of his involvement with what he created. Many people who don’t see themselves as strongly religious believe that God has principles for living and that it’s best to live by those laws. They believe in an inherent right and wrong and think that people ought to live accordingly. Moral laws are seen to be like natural laws such as gravity. Life goes best if you respect those life principles, such as loving your neighbor, etc. Many people would agree that God wants us to abide by those laws, but little thought or effort is put into connecting with the One who made the laws. They see God as a distant, disconnected deity. This is “life OVER God,” as Jethani puts it. They see the value of God’s principles, but they don’t seek to know God personally. 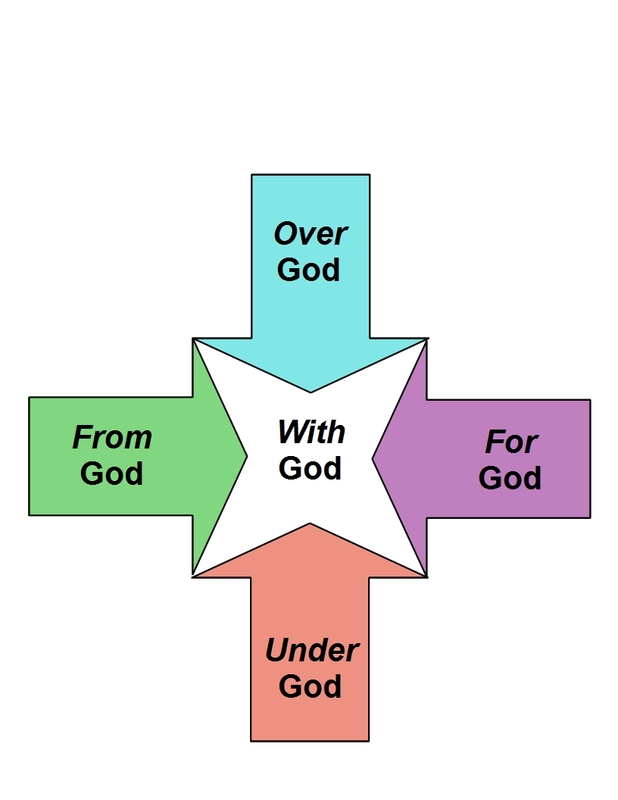 However, it’s not just other people who can live “life OVER God,” as Jethani explains it. His point is that we, too — those of us who are Christians, who claim to be followers of Jesus — can be living OVER God instead of WITH God. I’ve often referred to the Bible as God’s instruction manual for life. Though there’s an element of truth to that, it’s not the best description of God’s Word. It’s more than a set of instructions — a list of dos and don’ts — for living. It’s more like God’s journal in which He’s had written what He’s done, what He’s doing, and what He’s going to do as He involves Himself in human history and in our lives. It’s a journal in which God reveals His heart, where He communicates passionately about His love for us and His desire for us to be His and to be with Him now and forever. It’s a father’s journal to His children: to us! Jethani writes that “When the Bible is primarily seen as a depository of divine principles for life, it fundamentally changes the way we engage God and His Word. Rather than a vehicle for knowing God and fostering our communion with Him, we search the Scriptures for applicable principles that we may employ to control our world and life.” (eBook loc. 730) We can actually practice Christian principles when it comes to family, friends, finances, and fun without Christ’s being a part of the mix. It can mean that we really have a self-centered faith, looking for ways for our lives to work better, rather than a Christ-centered faith. We have a faith of principles for our own benefit instead of personalizing our faith with God. We can seek to live by God’s principles without getting close to Him, and there’s something in our fallen nature that seems to like that. We’re smart enough and have enough faith in God to know that we have to take Him seriously, and we think that the biggest part of that is living by His principles. However, that’s wrong! God wants more than our obedience: He wants us! We keep sliding into the posture of being obedient to God without wanting to get close to Him. Parents will bring their children to church in order to get a solid moral grounding, so that they can grow up to be good people. Married couples may be looking for ideas and ways to help out their marriages. 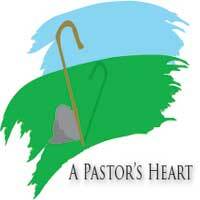 Pastors may go to church conferences so they can learn principles on how to build a great church. Struggling people can go to church to learn coping skills for getting through another tough week. All the while we’re afraid to get close to God! We miss most of what God has for us: a close and personal relationship with Him. We too can study God’s Word and learn its history and its principles but miss the One whom it’s all about. We can miss the very personal message that the desire of the Lord’s heart is to have a relationship with us, and for us to be with Him. Once some parents brought their children to Jesus so that they could meet Jesus and He could hold them and bless them. Jesus’ disciples thought that Jesus didn’t have time for children, but Jesus reprimanded them. The Biblical text states, “But Jesus called the children to him and said, ‘Let the little children come to me, and do not hinder them, . . .’” (Luke 18:16) We love the way artists portray that scene, with children on Jesus’ lap and settled at His feet, enjoying Jesus’ attention. Those children weren’t interested in learning any principles from Jesus; they just enjoyed being with Him! The principles of God’s Word are important, but a relationship with Him is the most important thing. Following His principles can and should be a result of our following Him and being with Him! Jethani writes that “We may reduce the Bible from God’s revelation of Himself to merely a revelation of divine principles of life.” (eBook loc. 736) The Heavenly Father’s holy book — His Holy Bible — is more than a notebook of His historical activities and His instructions and principles. It’s a journal to us, His children, that reveals the heart of the Heavenly Father! He doesn’t want us to live from a position of life OVER Him, where we simply stand on the principles of His Word for our personal benefit but resist coming to Him personally. He wants us to live from a position of life WITH Him!